With more than 700 mounted  and 100,000 foot  Mughal soldiers in pursuit, the Guru and his Singhs requested shelter inside of a walled compound also belonging to Rai Jagat Singh, his younger brother Rup Chand, and two others, *Bandhu Chand and Gharilu. Fearing repercussions from local authorities, Rai Jagat Singh at first refused, however, the others welcomed the Guru, who quickly set about preparing his warriors for battle. Guru Gobind Singh knew the advantages of the compound having successfully fought off adversaries there during skirmishes which had taken place several years earlier during 1702. He positioned Madan Singh and Kotha Singh at the single north facing gated entry with eight Singhs placed at vantage points along each of the four compound walls. The Guru, with his sons, directed the ensuing battle from secure positions from within the central two-story house where they could see to shoot the enemy with arrows from their bows. Daya Singh and Sant Singh mounted the top story with Alim Singh and Man Singh acting as lookouts. The warriors had a small store of weaponry, including matchlock fire arms with ball and powder carried from Anandpur by Himmat Singh. On December 7, 1705, at first light, officers of the Mughal horde, Khwaja Muhammad, and Nahar Khan sent a messenger with terms of treaty demanding submission to Islamic law, which the Guru, his sons and valiant warriors unanimously declined. Elder Sahibzada Ajit Singh reacted with outrage vehemently demanding the emissary be silent and return to his masters. The Mughal officers ordered their troupes to mercilessly attack the Guru's vastly outnumbered warriors. 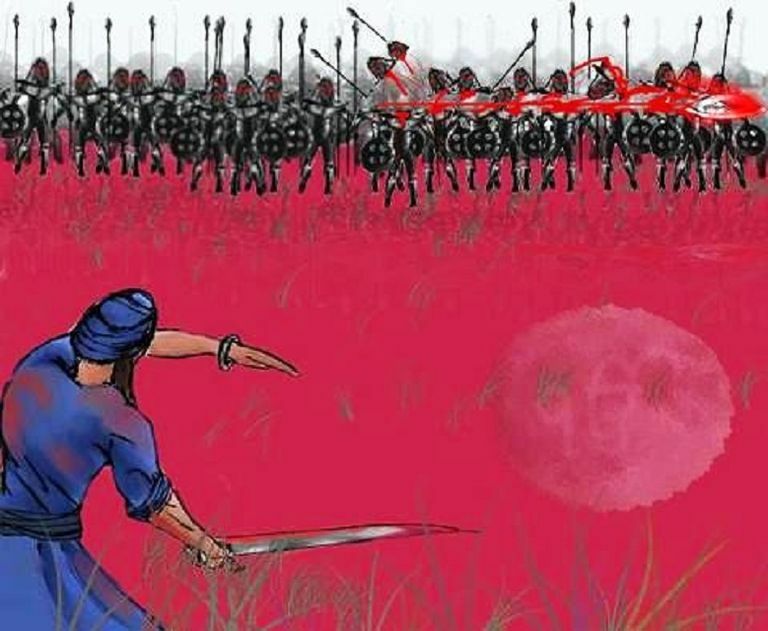 The Guru and his Singh's responded fiercely, defending their fortress from the horde's advance with deadly accuracy. Their small store of arrows and ammunition quickly expended, by late afternoon hand to hand combat remained their only option to surrender and forced conversion to Islam. Guru Gobind Singh's devoted warriors fearlessly embraced their fates. Five valiant warriors charged forth through the compound gates to greet death face to face, cutting down many of the enemies before succumbing to their injuries. Daan Singh, Dhyan Singh, and Khazan Singh followed taking a terrifying toll on their adversaries before welcoming death. Mukham Singh left his life riddled with scores of enemy musket balls. Himmat Singh bade his Guru farewell saluting his destroyers. Five heroic un-named Singhs banded together in a ferocious roar wringing life from untold opponents with their passing. Deva Singh and Ishar Singh impressed their foes with frightening fervor in their final farewell. A band of six warriors, Amolak Singh, Anand Singh, Lal Singh, Kesar Singh, Kirat Singh, and Muhar Singh, taking leave of their Guru, accosted their enemies, spilling their blood preciously as they expired one by one. Two Mughal officers, Nahar Khan and Ghairat Khan, and many of their soldiers died attempting to breach the compound. The warrior's heroic martyrdom held back the enemy hordes and prevented all out invasion of the fortress. Guru Gobind Singh's beloved elder two sons fearlessly requested to face the enemy. Ajit Singh, the 18-year old, eldest son of Guru Gobind Singh, sought permission from his father to go out from the compound and confront the enemy horde face to face. He led a charge with Alim Singh, Bir Singh, Dhyan Singh, Jawahir Singh, Sukha singh and Bir Singh flanking him. The enemy ranks fell before the five Singhs' fearless onslaught. Mughal officer Zabardast Khan retaliated full force overwhelming the Ajit Singh and his valorous warriors with sheer numbers. *Jujhar (**Zarowar) Singh, the 14-year-old, second son of Guru Gobind Singh solicited his father's consent to follow his brother to illustrious martyrdom accompanied by five heroic companions whose deeds, if not names, survive immortally. **It is told, these courageous heroes boldly slashed into the enemy lines leaving the fallen in their wake as the crocodile parts the water in pursuit of prey. With the death of his sons, only five brave singh's remained alive to fight the enemy hordes and defend Guru Gobind Singh. As daylight faded into dusk, the remaining warriors desired Guru Gobind Singh to make a safe get away. The Guru declined, expressing his wish to remain with his beloved devotees until his last breath. Daya Singh, Dharam Singh, Man Singh, Sangat Singh, and Sant Singh, held a council and formally ordered the escape of Guru Gobind Singh for the survival of the Khalsa Panth. The Guru replied decreeing that when ever, or where ever, five initiated Singhs formed a council, they would be known as the five beloved Panj Pyare and act as his living representatives for all time to come. He saluted the convened Panj and invested them with his armor and articles of sovereignty as his pledge of submission. The five brave Khalsa devised a daring plan to save their beloved Guru. Sangat Singh donned Guru Gobind Singh's ceremonial investments. He strapped on the Guru's armor, placed his Guru's feathered plume in the crest of his turban. He then climbed to a prominent place where he could be seen by the enemy in the last remnants of the day and held the Guru's golden tipped arrow high over head. So as not to be accused of cowardice, the Guru carried a lit torch as he slipped barefoot through the gate into the night. Sant Singh gave his life guarding the gate. The Guru releases his arrow into the enemy camp. The three remaining Singhs disguised themselves with fallen Mughal garb and went over the walls to join their Guru. They ran through the sleeping enemy camp calling out that the Guru had escaped. Confusion ensued and groggy Mughal soldiers mistakenly fell upon and slew each other in the darkness. The stalwart Sangat Singh held the fort long enough for Guru Gobind Singh to make good his getaway before succumbing to the ferocious Mughal horde who advance swarming through the gate and over the walls. The Mughals rejoiced over Sangat Singh's slain body, thinking they had captured and killed Guru Gobind Singh. By the time they realized their error, the Guru and his three companions, each taking a different route, had disappeared into the night. *** Inayat Khan chronicler of Ahkam-i-Alamgiri. *** Guru Gobind Singh in Zafar Nama 19-41.
Who are the Gurus & Historical Figures of Sikh History?